Suitable for camping, picnic, barbeque, outdoor or indoor party use. Reuseable, microwave safe and dishwasher safe. 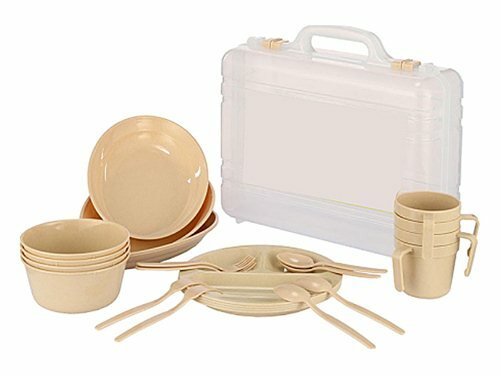 Consists of 4 pc long plates, 4 pc divided plates, 4 pc soup bowls, 4 pc drinking mugs, 4 pc spoons, 4 pc forks and 1 pc carry case. Material: Polypropylene (PP) food grade plastic. Size of carry case: 33.5(L) x 30(W) x 10.5(H) cm.